It's unclear how serious the president is about the idea, but Gov. Greg Abbott expressed skepticism for such a plan since the federal government isn't committing the billions of dollars Trump wants. It’s unclear how serious Trump is about the proposal. The White House did not immediately return a request for comment, but Patrick's office confirmed that the lieutenant governor had made the offer. "The lieutenant governor told the president that if the federal government will reimburse the state for that money, we will build the wall in the areas where it is needed along our 1,254-mile border," a spokesman for Patrick confirmed Thursday. The idea was met with skepticism from Gov. Greg Abbott. During a TV interview later Thursday, the Republican leader questioned how the federal government would be able to pay back Texas if it cannot currently get the funding it wants for the wall. 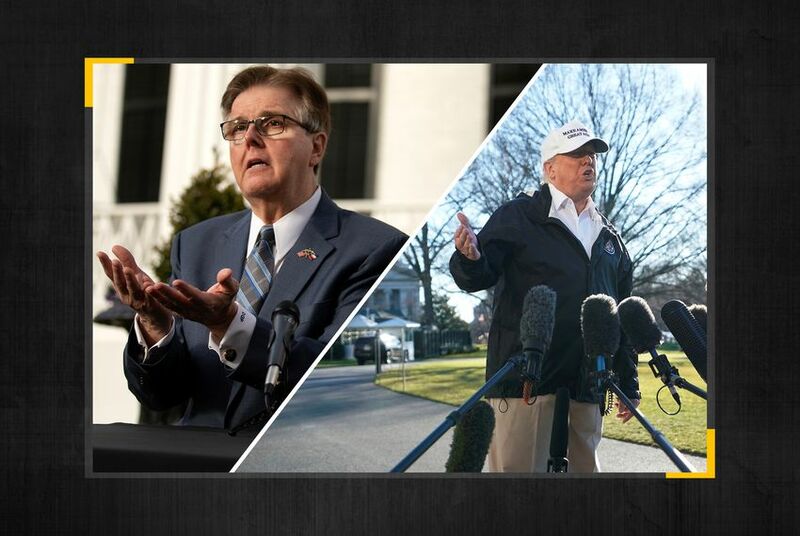 "It’s a hypothetical with no conclusion because the federal government is not stepping up and funding border security and so it’s a circular argument because we're all just waiting around for the federal government and Congress to do its job, to appropriate funding, to secure our border and our state," Abbott told KENS, the CBS affiliate in San Antonio. Abbott did not join Trump in McAllen. Trump's comments came on day 20 of a partial federal government shutdown — the result of a stalemate between Trump and Congress over Trump’s signature campaign promise. A number of Texas officials joined Trump at the border Thursday afternoon to discuss the need for border security, including both of the state’s U.S. senators, Patrick himself and Texas Attorney General Ken Paxton. Even the suggestion that Texas might help build the controversial structure drew immediate rebukes from top state Democrats. Trump also said Thursday that Patrick had encouraged him to be clearer about how Mexico would fund the wall — indirectly, Trump claimed, through a new trade deal that has yet to be approved by Congress, not via a check from the Mexican government. "And Dan said, 'Will you do me a favor? Say that,'" the president said.